Love starts in the Kitchen for this catering family. A spicy Romance Series with some open door love scenes. Robin Cove has had enough of her boss, is over her boyfriend, and makes a split-second decision to leave it all behind. Too bad she didn’t check the weather forecast before she left. Stranded on the side of the road when her old car breaks down, Robin fears her impulsive action will be the death of her as her body temperature steadily lowers to dangerous levels. Matt Landry is slowly making his way home in the storm when he finds an unconscious woman on the side of the road and rushes her home to his father Chris to save her. 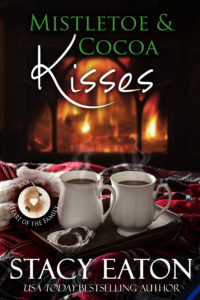 When Robin wakes up, she finds herself in the kind of home that she has always dreamed of having, except for the handsome man with the surly attitude. As much as Robin wants to stay, she knows she’ll never win him over and needs to find the right future for herself. Will Robin’s future bring her back to Chris and his kids, or will Chris lose the chance to have the love of a woman who will never leave him and the family he has always wanted? It’s been over a year since Robin took over Heart of the Family Catering, and it has grown into a catering company, cafe and bakery. Recently Robin hired a new employee, Finley Parker, and she’s not just an employee, but a friend. When Robin gets injured in a slip and fall accident, Finley takes over the catering planning. That means she has to sit down with Bridezilla and her fiance Roan Waterman. Only just a few minutes earlier Roan was flirting with her, and now she’s angry for even entertaining him for a moment. Finley has a visit from the past and learns something new about herself while Roan steps in to help her. That’s when she learns the truth about Roan and she finds herself wanting something that she doesn’t feel she deserves. 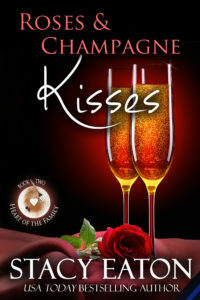 Wedding plans, frustrating brides, flippant grooms and chemistry that is cooking in the kitchen is what Roses & Champagne Kisses is all about. Rye Waterman left his bride at the altar, but not before he learned she’d cheated on him and was pregnant with another man’s baby. Determined to forget it all, Rye goes on his honeymoon to a tropical island alone. Amy Black was sent to the island to work on a special feature of a lifetime with a famous Caribbean chef who never gives interviews. Only problem is the resort lost her luggage, including her passport, the chef had a family emergency on another island, and now a category four hurricane is barreling toward the island, and she has no way to get off. 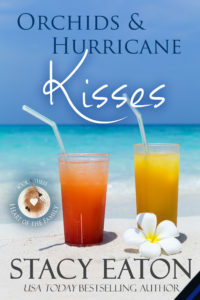 It’s laughter and twenty questions for these two as they get lost in a vacation romance that leaves them both wishing for more. When a crisis has Amy rushing home and Rye in a tailspin for her safety, it will take a tragedy and a miracle to bring them back together.